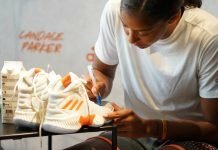 Candace Parker is back. Really back. She is back to being vocal on the court. She pumps her fists sometimes after making crucial game shots. She smiles during the game, and on the bench. The All-Star, eighth-year forward just seems happy playing. 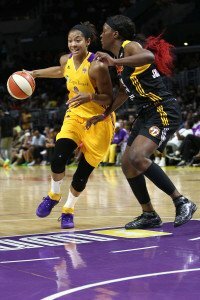 And perhaps nowhere since her return to the Los Angeles Sparks six weeks ago was Parker’s rebirth more evident than on Sunday, as the Sparks were trying to beat the Shock and secure a playoff spot. Parker had over 30 points as Los Angeles ran up their lead, and she positioned herself underneath the Tulsa basket to take a charge. The contact sent her sliding across the floor a few feet, and as the referee’s whistle tweeted the offensive foul, Parker pumped her fist hard, while still laying down. The crowd roared and Parker, still lying, kicked her feet in pure joy. Her teammates came to her laughing and pulled her to her feet. Parker smiled all the way to the bench, and kept smiling after she sat down. To be sure, two-time league MVP and rookie of the year Parker has always put up the numbers, since the Sparks drafted her with their first pick in 2008. But as she breezily palms the ball these days while deciding where to pass it next, her play and demeanor is remniscent of her college days at Tennessee, where she lead the team to two consecutive National Championships her last two years. 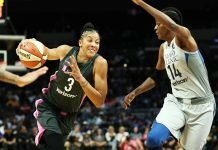 It seems like the WNBA rookie Parker, who dunked twice in her first season, has suddenly reappeared. And she’s stepped it up. 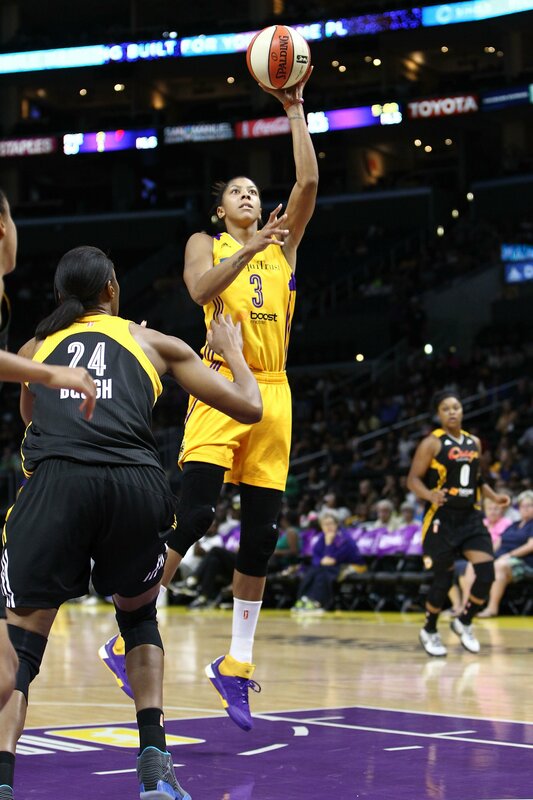 This year Parker leads the Sparks in scoring, at 19.4 points per game; rebounds, averaging 10 per game – up three from last season; and assists, with 6.3 per game, up from 4.3 in 2014. She has recorded 12 double-doubles, and made a career-high four three-pointers on Sunday en route to a 2015-best 33 points. 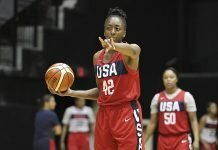 Parker announced before this season that she would sit out for part of it, after playing year-round every year since her graduation for both the Sparks and for Russia’s UMMC Ekaterinburg. During her time off, Parker spent a lot of time with family, including traveling to a family reunion. She acknowledged that the break was restorative for her both physically and mentally. Parker’s effect on the Sparks since her return has been meteoric. At the halfway point of the season, Los Angeles had won only three games and were all alone at the bottom of the Western Conference. 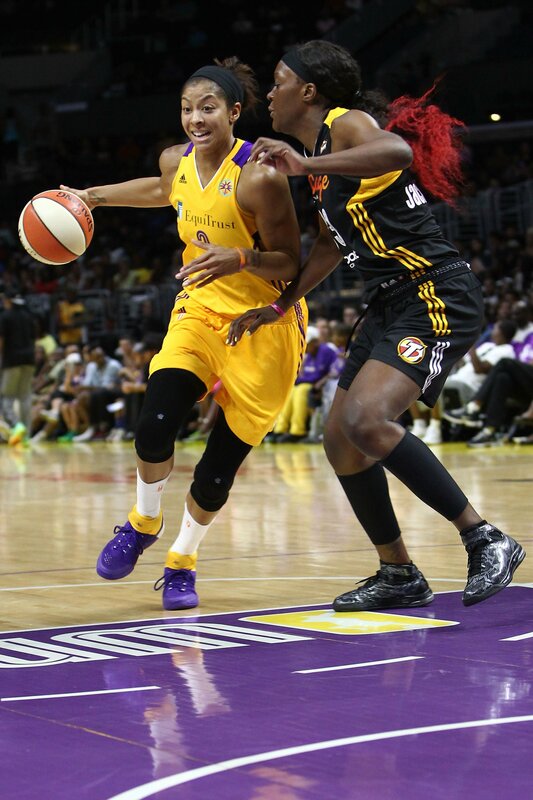 Since Parker rejoined them, the Sparks are 11-5 and are now headed to a WNBA franchise record 15th playoff appearance. She said they are continually getting better and still have a way to go. Since Parker came to the Sparks the team has been through five coaches, including current coach Brian Agler, now in his first year. The 2014 season saw a Los Angeles team that struggled with on-court cohesion both before and after coach Carol Ross was fired midway through the year, and replaced temporarily with general manager Penny Toler. Parker alluded to the difficulties and said she takes nothing for granted. As has always been the case, the Sparks have plenty of talent on the roster this season. Putting it together is the challenge. “It’s just mental with our team – raising your level of focus as the game continues, no matter what the score is. That’s been our Achilles heel all year,” Parker said after the Shock win. Agler said the responsibilty doesn’t all fall on the shoulders of the players. 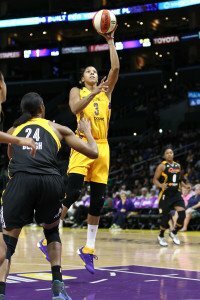 The Sparks play two more regular-season games this week, against the Dream and the Mercury, before they find out their playoff seed. Sue, I love your article and I agree Candace is definitely back. Sue I love your article and I agree candace is definitely back in action. It makes you wonder sometimes about the benefit of taking a half year off. It certainly refreshed Parker!